A few years ago, my friends were chatting excitedly about a new shop that had opened called, “Insomnia Cookie.” My friend, Evan, felt a bit out of the loop but nobody was clueing him in. It was funny for me as an observer, although, in the midst of it, Evan was getting frustrated. He was gaining information about Insomnia Cookie, but that information wasn’t helpful to him without a foundational understanding of Insomnia Cookie. The same can be true for mergers and acquisitions. You can learn about the process or the documents, but it won’t “click” until you have a solid foundation of what the entire process should involve. 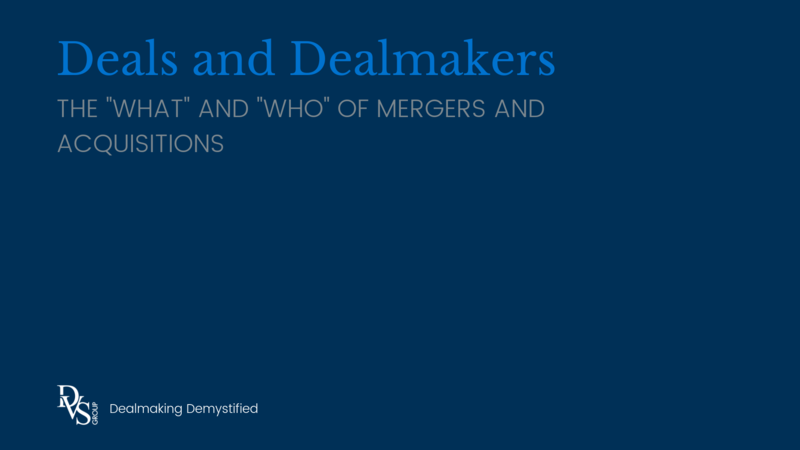 Let’s build that foundation by covering the “what” and “who” of mergers & acquisitions – deals and deal makers. You’ve probably made a deal before. If you’ve been part of the business world for a while or purchased a home or sat at the elementary school lunch table, you understand the challenge and thrill of getting a deal done. 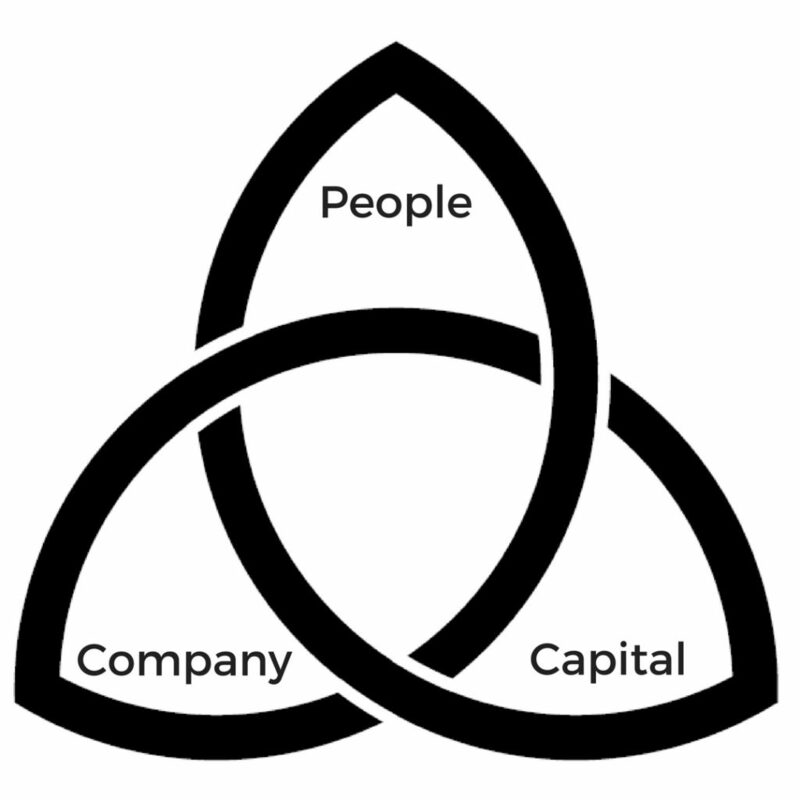 In the small business/lower middle market merger and acquisition context, a deal happens when people, capital, and companies come together in a new way. We call this the deal triangle. Deals must bring a change in business ownership. That means a person or entity is buying 100 percent of a company, taking a controlling interest in a company, or (much more rarely) buying a minority interest in a company. This means that getting debt from a bank doesn’t qualify as a deal on its own; bank debt doesn’t change ownership structure. A deal is considered “closed” when a Definitive Purchase Agreement is signed by both parties – the buyer and the seller – and the money is wired. The conversations, negotiations, and process that lead up to that point are “dealmaking.” Everything that happens after the deal closes may be a consequence of the deal but is not considered part of the dealmaking process. Who are the deal makers? There are two key groups of people in deals: deciders and advisors. Deal Deciders are just that – the individuals and groups that initiate a deal and then decide if it’s going to close. Buyers are broken into three categories: owner/operators, strategic buyers, and professional investors. 1. Owner/operators are often executives who want to buy companies where they will replace a departing founder or owner. They will be personally involved in the business at an intimate level on a daily basis as a key employee. 2. Strategic buyers are other companies who can create immediate synergies with the company they purchase. 3. Professional investors include private equity groups, independent sponsors, and family offices. Professional investors are basically money managers; they view the company as an asset and won’t be involved in operations daily or even weekly. Professional investors have other people run the acquired company for them until they sell it. Some Deciders are sophisticated deal makers. They are continually doing deals – buying and selling companies as a professional discipline. Private equity groups and family offices fit this category. But, most business owners or business buyers (particularly owners/operators) are not professionally part of the dealmaking industry. They are focused on running and growing a business and thus, only occasionally venture into the dealmaking world when they have a deal that needs to get done. Regardless of their experience level, Deciders will probably use the services and expertise of dealmaking advisors to guide them through the dealmaking process. Many business owners or business buyers use attorneys and other advisors throughout an “informal” process rather than going through an organized merger and acquisition marketplace with an investment banker. These kinds of “informal” deals happen all the time, especially in small and lower middle market businesses. Family transfers across generations, sales to incumbent managers, or deals with friendly competitors are all great examples. To recap, many deal Deciders are sporadic and temporary deal makers; once they have signed and closed a deal, they refocus exclusively on their professional discipline of growing a company organically. Deal advisors are trained in some form of professional discipline and, generally, work in industry-specific firms that specialize in those disciplines. Advisors generally come together, across disciplines, to get deals done. It’s important to note that not every attorney is a deal attorney; not every accountant is a deal accountant; not every banker is a deal banker, etc. Advisory deal makers are individuals who excel at dealmaking and bring that expertise to the table, in a timely and appropriate manner, when a deal needs to get done. It’s important that you discuss the level of experience your advisors have in M&A processes when choosing your team. Inexperience isn’t always a killer, but it sure helps to know what to expect from your advisor before things start to get weird. What are the incentives and motivations behind those deal makers? It is relatively easy to understand the desired outcome for buyers and sellers throughout the dealmaking process: They want to get the deal done. It may be a bit harder to understand how the deal advisors are motivated and incentivized. The chart below lays out how each type of deal advisor makes money, who they are advocating for, and what they are motivated to accomplish. Having a grasp on these mandates and incentives provides an understanding of what types of behaviors each person will gravitate toward and why. We’ve seen attorneys pick obscure fights with the other side of the table so they can up the hours on their invoice. We’ve also seen investment bankers close deals they shouldn’t close because they get a commission on the transaction. This chart is not mean to be cynical – simply realistic. Of course, these are the underlying incentives. If the deal advisors are known and trusted, it should be apparent that their top priority is the best interest of those they are advising. 2. Get retirement plan for management of new company “I wisely invest my client’s money and generate advantageous tax-oriented investment options. I put my client in the best position to live off investments while increasing the firm’s assets under management. Merger and acquisition deals are when people, capital, and companies come together in a new way. They always bring a change in ownership. Deals are considered closed when the Definitive Purchase Agreement is signed, and the money is wired. Deals get done with two types of people: deciders and advisors. Deciders are the buyers and sellers. Advisors are a variety of deal professionals that come together across disciplines to advise and guide the buyers and sellers. Deal advisors have various underlying incentives and motivations while working on a deal – which is helpful to recognize for the sake of understanding and influencing behavior. Hopefully, an explanation of the “what” and “who” of dealmaking provides a foundation to build other dealmaking knowledge on. Just like when someone finally told Evan, “Insomnia Cookie sells fresh-baked cookies for $2.50,” he could finally appreciate the fact that it was open until 2am.